In the end, it didn't matter that this match had no official sanction. Try telling that to the tens of thousands of people who thronged the National Stadium in Karachi. In the end, what counted was that an international XI, no matter how ragtag and rusty it was, had set foot on Pakistan soil, and had safely played a game of cricket. A game, such as this, had not been played for close to four years in a nation where following for that game frequently crosses the line between passionate and fanatical. For the record, Pakistan All Star XI demolished International World XI who were led by the 43-year old Sanath Jayasuriya. Young batsmen Umar Akmal and Shahzaib Hasan made half-centuries at frenetic pace and were backed by handy contributions from the rest. Pakistan XI were set on their way by the pair of Shahzaib and Imran Nazir, who put on 83 by the time the field restrictions were lifted, at nearly 14 an over. The International XI fielders showed they were short on match practice by dropping numerous catches and fielding poorly on a ground where the ropes had been pulled in. Shahzaib was the first to fall for 54 off just 21 deliveries, which included six fours and four sixes. Akmal, coming in at No. 5, soon took over and blitzed ten boundaries on his way to an unbeaten 67 off 37 as Pakistan XI zoomed to 222 for 7. Thandi Tshabalala, the South Africa offspinner, picked up 3 for 20 while Shapoor Zadran, the Afghanistan fast bowler, took 2 for 38. 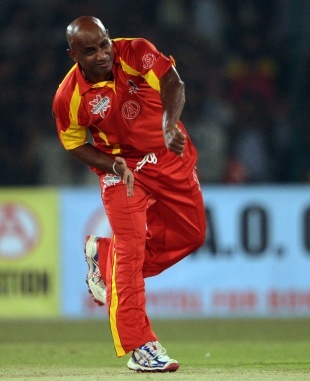 Jayasuriya hit a six and a four in the first over of the chase but fell of its last delivery, caught by his counterpart Shahid Afridi. Facing such a tall target, International XI kept losing wickets regularly, and fast bowler Tabish Khan soon dealt the decisive blows. He bowled Ricardo Powell, Jermaine Lawson and Tshabalala off successive deliveries to take a hat-trick and reduce International XI to 52 for 6 in the seventh over. Zadran stuck around to make 42 along with Loots Bosman, who batted low at No. 9 due to an injury and remained unbeaten on 27. Pakistan used everyone but wicketkeeper Sarfraz Ahmed as bowlers. Afridi, who had lasted seven balls with the bat to club three boundaries, had Zadran stumped off the final delivery of the match as International XI managed 138 for 8. The second and final game in the series will be played tomorrow at the same venue.